Located in Wiltshire, England, Stonehenge is the most famous monument from prehistory in the world. Today it and Avebury make up the heart of a World Heritage site that has an exclusive prehistoric monument concentration. The first structures in the immediate area are four to five pits with three of them having held huge pine posts similar to totem-poles that were put up in the Mesolithic Period (8500-7000 BC). It is still unknown as to how these posts are linked to the later construction that became Stonehenge. A Neolithic monument complex was erected and included a causeway inclusion at Robin Hood’s Ball, two rectangular earthworks, and numerous long barrows dating to 3500 BC. These constructions likely influenced the location of Stonehenge which was built later. The first structure of Stonehenge was built around 3000 BC and was a circular ditch that had inner and outer banks. It encompassed an area that was about one hundred meters in diameter, with two entrances. By 2500 BC the enormous stones were set up at the center of the structure. Two types were used: the larger stones are called “sarsens” and the smaller are called “bluestones.” The sarsens were put up in two coaxal arrangements- the inner horseshoe and outer circle. The bluestones were erected in the middle of them in a double arc. Later the middle bluestones were altered to form a circle and inner oval two hundred to three hundred years later. The stones were rearranged again after that to reform the horseshoe. Also being constructed around this time was the earthwork Avenue which linked Stonehenge with the Avon river. Much later after Stonehenge was completed- four sarsens were decorated with numerous carvings showing axe-heads and daggers. Stonehenge offers a variety of sights to see and activities for visitors. Stone Circle- The Stone Circle is a work of genius engineering and constructing it would have required enormous effort form hundreds of extremely organized people with only simple technologies and tools. Visitors will be awed by this feat of engineering. Neolithic Houses- Visitors can explore the Neolithic housed outside the visitor’s center and imagine how their inhabitants lived 4,500 years ago. Experts demonstrate prehistoric domestic skills such as flint knapping, making rope from rushes, and grinding grains with a rider and quem. “Standing in the Stones”- The visitor’s center offers a 360-degree audio-visual look from inside the stones. 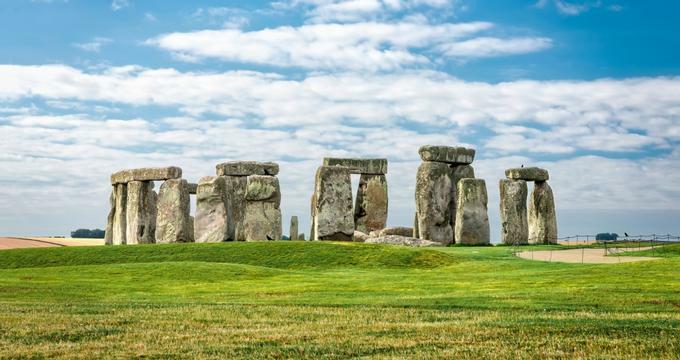 Visitors can “stand in the stones” and imagine what it felt like to ancient people to stand in the middle of Stonehenge during the summer and winter solstice. The visitor’s center also offers an interactive map. Visitors will get a look into the environment and how it evolved before, during, and after Stonehenge. Feast! Food at Stonehenge- This exhibition contains objects loaned to the visitor center from its partner museums. The objects include a Llyn Fawr cauldron made of bronze. The exhibition is meant to help visitors learn the lifestyle and diet of the people who constructed Stonehenge and help them understand the science that goes into figuring it out. Stonehenge offers several educational opportunities for both teacher and students. Field Trips- There are two options for field trips. Teachers can choose to lead their students through the site on their own or allow the staff experts to lead an interactive Discovery Visit. Teaching and Learning Resources- Experts are constantly developing resources to support teachers and their classes before, during, and after the trip. Teacher’s Kits- Free educational kits designed to give the class in depth information on Stonehenge are offered. Visitors also have the option of bringing a picnic or acquiring food from the café to enjoy out on the landscape of Stonehenge. The gift shop offers a variety of clothing, books, souvenirs, and gifts to remember a visit by.